Before discussing Regramming on Instagram, first, we need to have a clear picture of it. 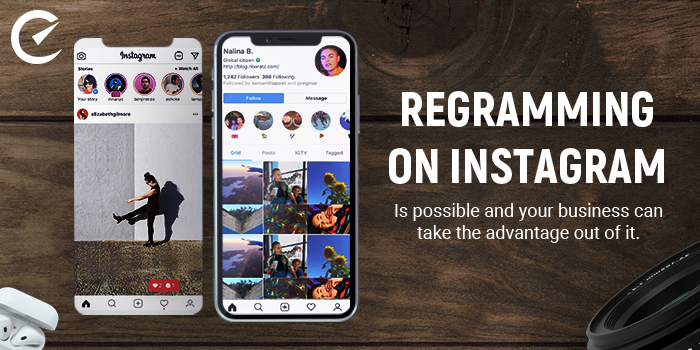 Now, the first question that comes into our mind is what is Regram? “#Regram ” is a hashtag which you must use for re-posting someone else’s Instagram post onto your own account. You can either take a screenshot or save that post and re-post it again from your personal account. While re-posting you need to put a hashtag # Regram and acknowledge the source from where the original post was taken. This acknowledgment is also beneficial for you personally. Once you start reposting using the #regram hashtag you are creating more awareness about the post and in turn generating more followers both for you and the organization. The organization also enjoys this kind of publicity and why not? We all love getting famous. In turn, your business can also gain a new client (which is, of course, an added advantage). But one thing you must keep in mind. Regramming of the post without giving credit to the original source or not putting the # Regram hashtag is an offense. You should avoid doing that. Now let me get into more details of how it is going to impact your business? Suppose a famous personality or an organization is working for any social cause. You took a screenshot and posted it again, sharing the details of the original content and the purpose behind it. In that way, both the organization or the famous personality and you gain millions of followers for that post. Some among those followers might be curious to know about you and your business as well and might be curious to work with you. Thus, you might also get a new client which is obviously beneficial for you. a. You might read an inspiring post, which you want the followers to read as well. b. You might want to introduce yourself to a particular client which you can by reposting their post and getting their attention. c. You might want to grab the attention of the media for performing a certain task. d. You might want to showcase your partnership with any particular client to the public and re-post the blogs or articles which might be helpful both for you and the company. Copying an article or post is actually admiring it. You post only those articles that you really like or has got some true meaning to you. But whatever you do, never forget to give credit to the source because that way you show respect to their work.